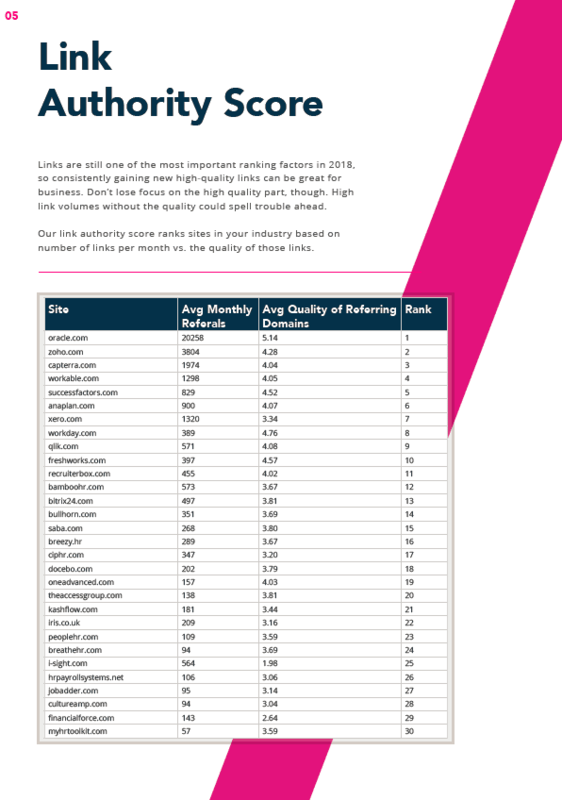 Our latest HR Software report compares the top 53 sites in the UK market. The report aims to provide an unbiased look at the sector on the whole, comparing key metrics to help brands see where they’re succeeding and where they could make improvements. One of the best ways to find out where you need to improve is by looking at your competitors. Our report helps you do that at a glance. We’ve collated data about all the stuff that’s important to your site; key metrics like SEO visibility, social scores and link authority. From our findings, we hope you’ll gain some actionable insights which, when used alongside our analysis and recommendations in this post, will help you to improve your site’s performance year on year. 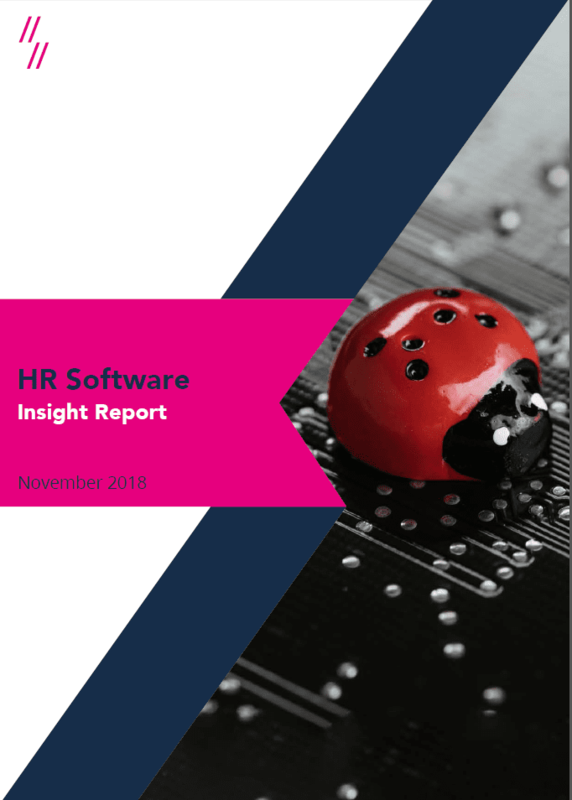 This report only features the top 53 HR Software providers, but we source our data from the whole sector. That means we’ve probably got your data stored away safely, even if you can’t see your brand on the list. Just ask and we’ll be happy to share it with you. Producing the report is only half the job. While the charts and tables provide excellent statistics, it can be difficult to sit and understand what most of it means. We don’t just put together the data, we do the research manually, meaning we search for the keywords, inspect the links and check out the social profiles. Here are our biggest and best findings which are best read alongside the report. 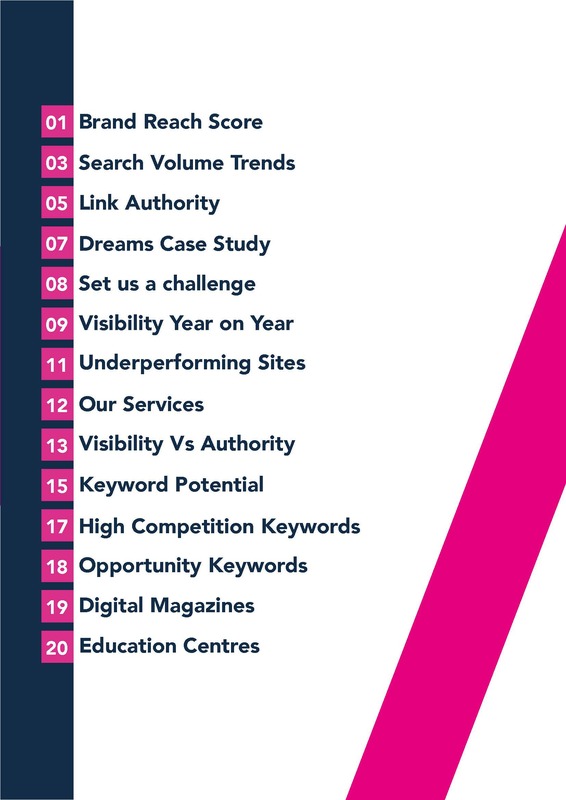 Getting those top spots or appearing for competitive keywords on Google is the aim of everyone’s game. Increasing your visibility can have a major positive knock-on effect on other metrics like sales and conversions. Search Metrics is our go-to tool for gathering our data on visibility as it allows us to track large keyword sets to see a brand’s past performance. This helps us to seek out the winners and losers in the sector. Overall, it’s been a successful year for the HR Software providers with only three of the top ten losing visibility. Oracle is top of the charts for visibility and have had a 27% visibility increase. It’s been a fantastic year for Capterra who has almost doubled their visibility this year with a 91% increase. 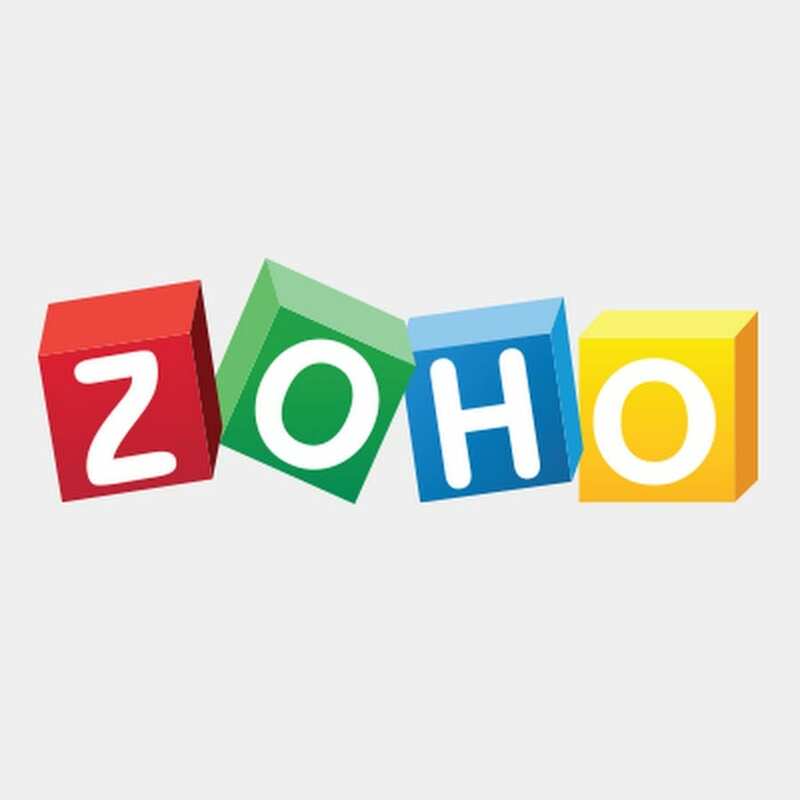 Next up is Zoho who has, unfortunately, lost 39% visibility year on year. 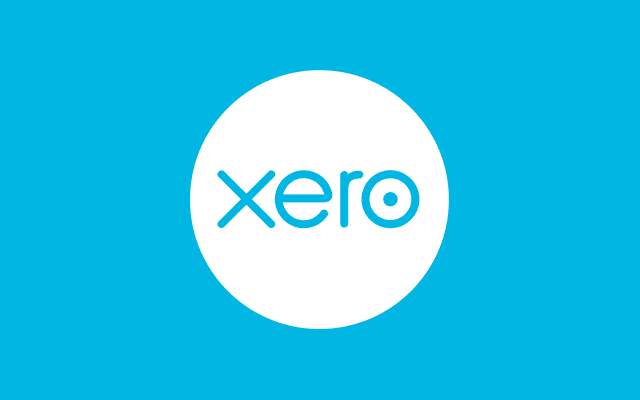 Xero is in fourth place and have more than doubled their visibility with a 137% increase. Making up the top five is Kashflow who have also performed brilliantly this year and increased their visibility by 58%. It’s difficult to gauge the intent behind a lot of these keywords at first glance. However, from searching the terms we can see that there are lots of questions around this area. With so many questions surrounding these terms, there are lots of chances to get into a featured snippet. Featured snippets put you at the very top of the page, or position 0. Well done to Breathe who is ranking in a featured snippet and position 1 for the highest opportunity keyword ‘hr software’. 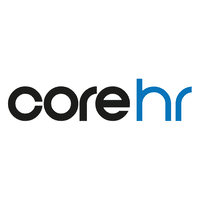 Their HR Software page answers, ‘what is HR software?’ and explains what their software can do. This kind of enhanced page copy not only fulfils the user intent but also helps with page rankings and visibility. A huge well done also to hrpayrollsystems.net who is ranking in position 1 and 2 and also a featured snippet for the keyword ‘hris’. They have only just made it into the top 40 providers in terms of visibility, so this is a huge achievement for them. Again, these rankings and featured snippet can likely be attributed to their rich page copy which is rich in content and information. The pages that feature are their HRIS page and also HRIS Benefits, proving that they know what searchers are looking for. Capterra is ranking in position 1 for the terms ‘hiring software’ and ‘hr management system’. 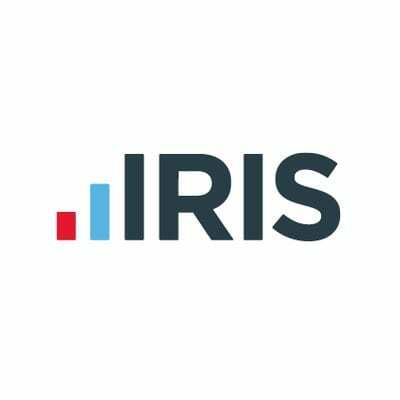 Iris is ranking in position 1 for ‘hr and payroll software uk’. Ciphr has a featured snippet for the term ‘hr software systems’. Surprisingly, the top five providers for visibility don’t seem to appear very high up in the SERPs for our high competition and opportunity keywords. It can be extremely difficult to gain high-quality links, especially in a ‘dry’ sector like this one. One excellent way of doing this is by having a strong content marketing strategy and an outreach plan to go alongside it. With links being one of Google’s biggest ranking factors, this should be a strategic priority when it comes to your digital. Oracle is topping the links charts with the highest number of links per month of a very high quality. 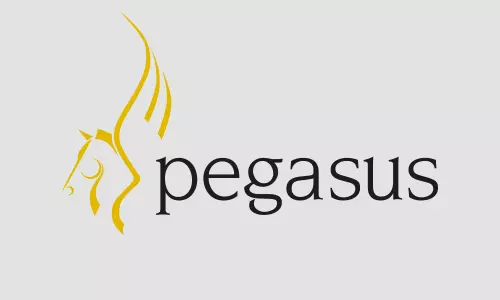 They have a documentation section on their site which has guides on all their products and services which are extremely detailed and specific. These gain a lot of links and are brilliant from a resource perspective. A lot of the links are also coming from University sites which usually have high domain authorities. These are extremely valuable links. We love Zoho’s invoice generator tool which has over 90 backlinks from various tech sites. The tool allows users to fill in their own details to a ready-made template and download it, send it or print it from the tool. This kind of tool is extremely helpful and provides value to users. It’s a perfect example of content marketing. This content will provide help to a user and hopefully ensure they come back to use Zoho’s services. 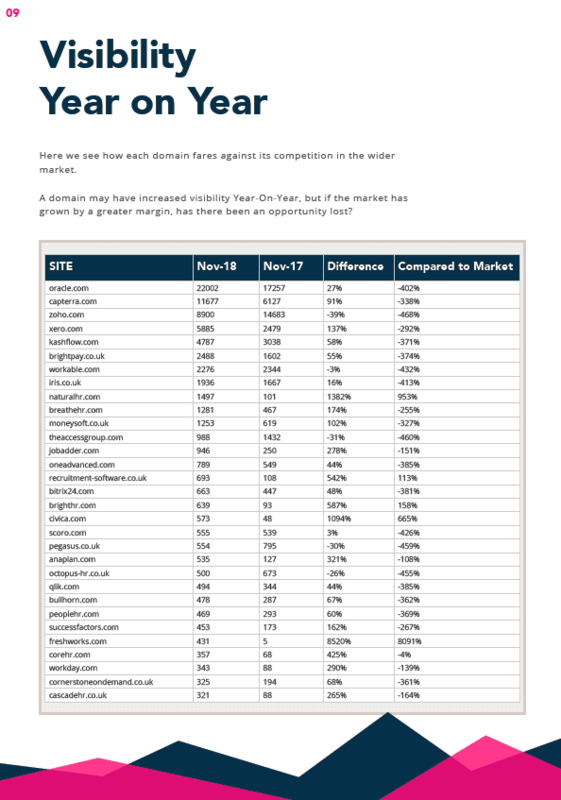 Capterra produced an article which was last updated in 2016, including email marketing statistics from 2014, 15 and 16. This article has gained over 370 unique backlinks including Business Insider. With articles like this, you can keep the content evergreen by updating the statistics each year but keeping the same URL. By using the same URL, you can keep the authority and trust you have hopefully built up if the content received any links in previous years. These are three examples of content types that are brilliant for link building in this sector. The only criticism we have is that most of this content exists on subdomains rather than subfolders. Moving content into subfolders retains the most effective way to retain the highest possible link equity for the main site. Brand awareness and social media go hand-in-hand, especially in today’s world of constant connectivity. HR Software platforms rely heavily on reviews and testimonials, and social media is the perfect platform to showcase these. Oracle is topping the social charts with the highest owned social score and a good number of brand searches per month. This is unsurprising considering they are an international brand. They regularly post news stories about their brand and the sector. 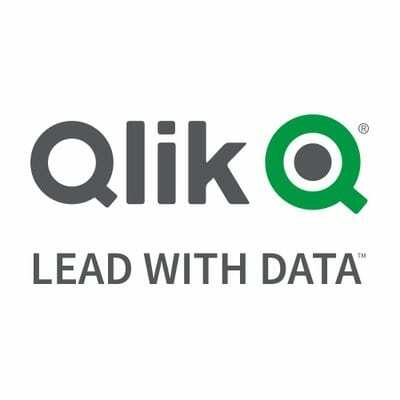 We love this social video they produced about a new autonomous database. Evidently, so did other people; it’s had over 30,000 views and 269 shares. Xero is next in the list with the highest number of brand searches per month. They have also recently introduced a video series discussing digital tax to make the process easier for customers. This kind of content is ideal as it explains difficult to terms or subjects and makes them easier to understand. It’s also perfect for sharing. They also post regular links to their content, highlighting important dates for HR managers such as payroll updates. 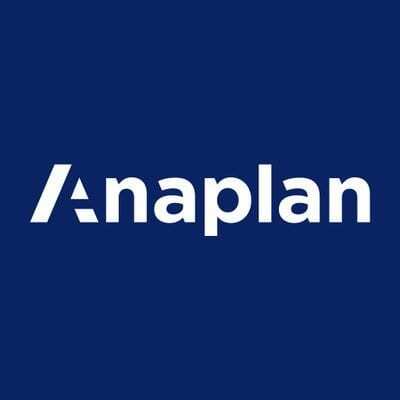 While you may not think Instagram is the right social media platform for an HR Software provider, this is the place you can shout about customer reviews and testimonials. It’s also a chance to reach a younger audience and give people a more personalised insight into your brand. With an estimated 85% of millennials using their phones to make purchases before any other device and a membership of over 500 million, you can tap into this market with a tailored campaign. Instagram is the perfect place to advertise your offers, post images and testimonials from clients and link directly to your booking and information pages. For further information about any of the data in our report or need help with any of the issues outlined, challenge us.